Are you looking for an easy to print calendar 2019 in A4 size? Stop searching now and download our free printable 2019 Calendar Template as one portrait formatted A4 Word file! 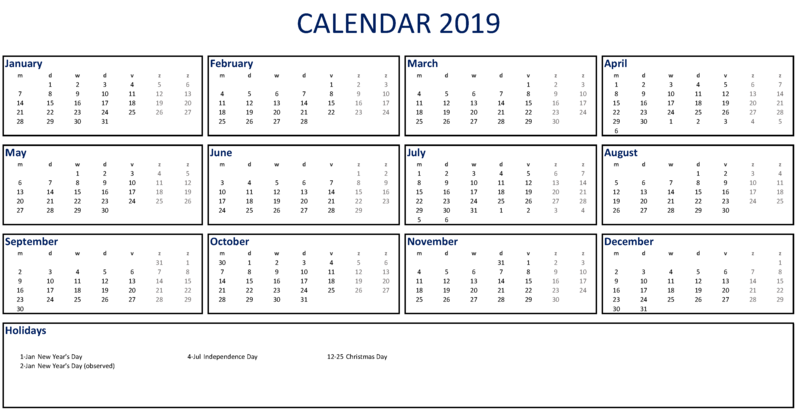 We provide free 2019 calendar templates in many formats including Excel and PDF. This Microsoft Word calendar works pleasantly with other writing applications like OpenOffice, LibreOffice, and Google Docs. Most of the templates are available in landscape and portrait format. Many calendar templates are designed with high-quality background pictures which are suitable for any kind of printer. For 2019 calendar templates in Word format visit our 2019 Word calendar page. Microsoft Word is available in .doc format for your convenience. Also easily customizable to add or change the public holidays. • The templates are blank, printable and macro-free and are easy to edit, amend, save and use again later. Download our Print Calendar 2019 A4 word calendar including notes template with US holidays. It also has large separate space available for appointment and notes. Using our Calendar templates guarantees you will save time, cost and efforts!